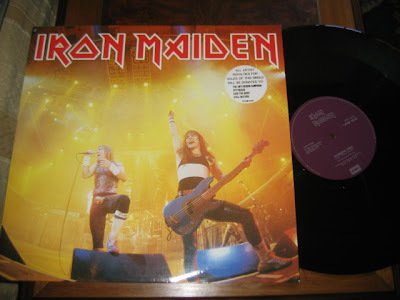 My Iron Maiden collection: 12' collection: Running Free Live 1985 single in black vinyl. 3 tracks. UK press. 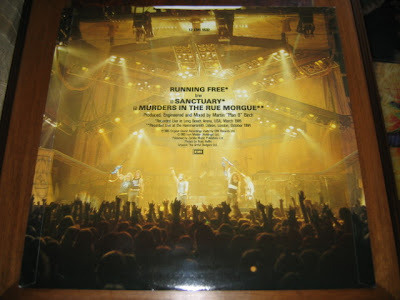 12' collection: Running Free Live 1985 single in black vinyl. 3 tracks. UK press. Running Free Live single was released in 23/09/1985 and reached the number 19 position in the UK top chart. Was to promote the very first Maiden live album , Live After Death. The front sleeve is just a live photo, first time they didn't put Eddie on a cover. All the royalties from the sales of this single were given to a anti-heroin campaign. Labels: 12' collection: Running Free Live 1985 single in black vinyl. 3 tracks. UK press. The new box from Iron Maiden is on the stores now. Don't waist the chance to get it before prices increase on Eaby and everywhere. - Second batch of vinyls, Piece Of Mind, Powerslave and Live After Death were released last week. Get your hands on it! Hello there!! Jorge here!! Hi!! Hi! 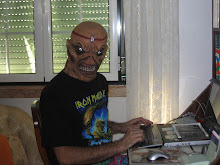 !Welcome boys and girls to the best Iron Maiden blog on the web. The aim of this site is to show my modest collection, with texts and thousands of photos like you never seen before.I'm not the best collector but I'm sure a good one. I collect Iron Maiden stuff for about 12 years and three months and now I think its time to share all this with you guys, I hope you enjoy it.Turilou!!! - Click on older posts to continue your journey. - You can also click on the photos to enlarge and see more closely.